Went back into town noticing that there was a misty look at the coastline that I thought would photograph well. I ventured across forbidden territory here to get this shot ( “there might be serious injury”). This particular piece of coastline has been eaten into recently with fierce wave action. It became the focus of this shot with the geology in the cliff! I’d love to know what the layers meant! 1. Our friends from the Mt Cook adventure had another one trying to get home! Spun off the road doing a slide, then a 360 and then into a bank. Amazingly had no damage - to car as well as passengers but they had to stay a night in a Central Otago town before venturing onwards. 2. John found 5 bags of cash in his wardrobe that he had saved - the coins. He cashed them in and now has a heavy wallet! 3. I’m looking into his wardrobe to see if there is anything more hidden?? (we don’t have walk in ones - just separate). 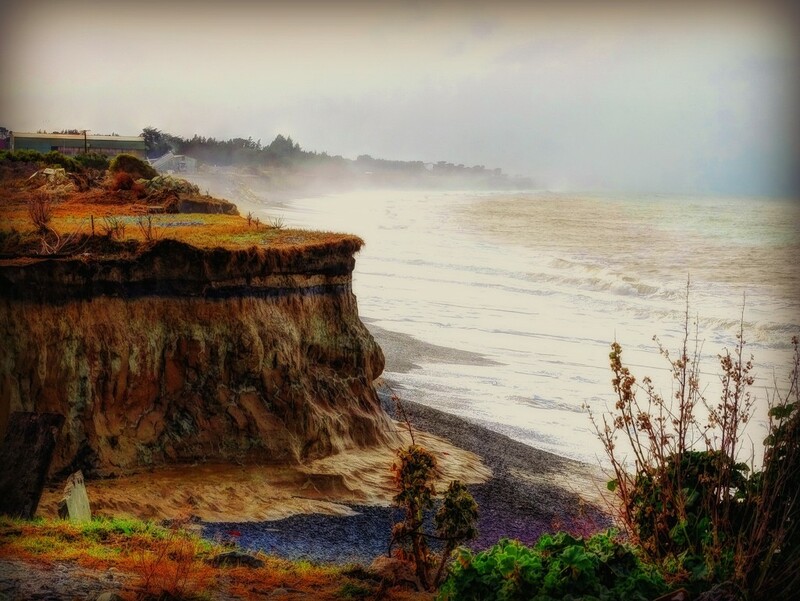 Tags nz, oamaru, eroded cliffs"
Beautiful composition and perspective Maggie! This could easily be an oil painting! Fav! Well spotted. A glorious scene with the misty background and bold headland. Lovely misty moodiness to this coastline which you have captured well. I too am fascinated by the prehistory that cliffs reveal - in a parallel universe I might have become a geologist. @snaphappi Its interesting to see what you might have chosen as a profession after the event! I think I would have wanted to be a policeman (lady) except for the writing of reports! This is a really great shot.. We photographers risk life and limb for a good shot.. I hope the erosion of your coastline and ours never meet.. Wonderful Maggiemae! An instant fav for the details on the left and the stark contrast to the mist. You have captured some interesting earth colours here, @maggiemae . It's a very nice picture indeed! @summerfield No, but I found a musty old pair of shoes that he hadn't worn for years - got them out and he put them in the garage! @taffy Thanks for your fav, Taffy - thats special coming from you! Amazing layers of colour & texture...you can see every line of time there almost. Moneybags John, a lovely find! @happypat Think I'll just have to find a stray geologist in Oamaru and ask him about the cliff structure. There is another huge cliff here that has just been investigated and was stated to have been several volcanoes millions of years ago! A beautiful image of colour and texture! The rock formation is so interesting -,I wish I knew more about it. What a lovely find in John's wardrobe -,bags of money! I wish I could find something exciting in mine! Only dusty old shoes and handbags! Which reminds me I must have a clearout! Fav for your fab composition! @pamknowler Well, I am glad that I didn't find any lady's clothes hidden in the back of John's wardrobe, Pam! What a perfectly composed capture of the amazing cliff and mist. My first thought is the different colors in the cliff are different layers of soil and rock. Wonder out many years it has taken to reveal all that? I'm glad Sadie made the trip back in one piece. @lesip There is clay there which is probably the reason for the wave battering this gap out, Leslie! Sadie breathed a sigh of relief when she got home! Such gorgeous depiction of this gorgeous countryside, Maggie! A truly amazing image! It looks like a print from a book or a magazine! Well done! Absolutely stunning land /sea scape -this immediately took my eye --beautiful pov, , composition and love the edit and colours ! Wow... it almost looks like the cliffs are melting into the sea. Great colors, too. Secondarily, so fun that John has "heavy pockets." Maggiemae! This is simply beautiful....the processing perfection. Hard to take my eyes off of it! Nice shot. The colours make this look very dramatic. @eyesmile When I downloaded this Gena - i was so intrigued by what I had captured! I wanted to know more about the geology! interesting shot, the erosion has created a nice sheltered little bay by the look of it. @shirleybankfarm No its a tiny bite in the landscape, Shirley and a building is about to collapse right here! Great layers and the light is showing them up so well. This is a stunning photograph as well as being fascinating. Geology has always interested me. I just love the layers and the colours. Big Fav. Husband is out so off to search his wardrobe before he gets back!! This is a brilliant capture. @thistle Lets know if you find anything interesting besides old socks and past presents that he has never used! Comp, colours and textures here are wonderful, fav for me! In one of your recent comments on my shots you mentioned that your son is looking to settle somewhere in Canada. If he likes big cities, he would probably like Toronto. One of the things I like about it is that it has lots of green space. But it's also a somewhat expensive place to live, and the public transit system, which used to be considered one of the best in North America, is rather falling apart. It seems to be hard for the various levels of government to decide what to do about it, or how to pay for whatever they decide on doing--and it will take a long time. On the plus side though, we no longer have Rob Ford as mayor, a fact for which the rational beings among us are profoundly grateful. Just my two cents' worth about the city I live in. @tristansmum Thanks for this Stephanie! Nice to know. They are presently in Vancouver but think its too expensive there. Last time I heard they were in Canmore looking around. Very interesting take on the erosion. A bit too heavily processed for me, but nonetheless fascinating. @kwiksilver I think you may be right but I liked the way the strata layers came out. I am so glad this made it to the PP! I don't know why but a windswept coast is always very appealing and moody. This one is no exception. Beautiful! What a gorgeous shot, Maggie. Must fav. Glad you didn't get injured in the shooting of this fabulous scene. Not fun about your friends. Glad nothing or nobody got injured. Loved the 3 things. 5 BAGS??? How big were the bags? Keep searching his closet and make sure to check shoes and other things!